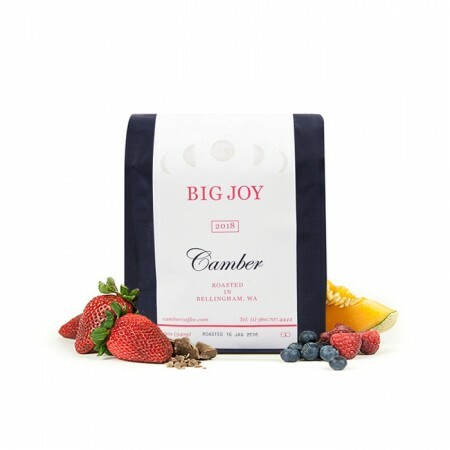 The Big Joy was roasted for you by Camber Coffee. This is a blend of fully washed coffees from Palomos Del Sur in Colombia and La Union in Peru, grown between 1,800 - 2,000 meters. Camber's approach is always to articulate sweetness, complexity and body and this coffee is a great example of that with notes of rich semisweet chocolate balanced by notes of raspberry and plum. I really enjoyed this as a Chemex brew. I picked up the fruit notes, but they faded into a slightly "bitter" chocolate taste - this is the good kind of bitter - I really liked this coffee. Solid overall but not as balanced as I would have liked. Very finicky to dial in. Please don't ever send us this coffee again. This is second time we got it, and I gave it one star last time too! Loved it as a latte.